NEW YORK–Nagorno-Karabakh President Bako Sahakian met with the co-chair of the US Congressional Caucus on Armenian Issues Congressman Frank Pallone on Saturday for talks on the Nagorno-Karabakh conflict and US-Karabakh relations, reported Sahakian’s press office. Sahakian told Pallone he appreciated the Congressman’s support and objective advocacy of the Armenian cause and the Nagorno Karabakh conflict. Pallone, for his part, expressed his readiness to continue his activities to further develop and strengthen relations between Nagorno-Karabakh and the United States of America. Sahakian was in New York Saturday for a series of meetings, which also included consultations with representatives of the Armenian Revolutionary Federation’s Eastern US Central Committee, Hovsep Avagian and Karo Ketsemanian. He also visited the Armenian National Center of the Saint Gregory the Illuminator Church of the Eastern USA Diocese of the Armenian Apostolic Church and met representatives of local Armenian community. 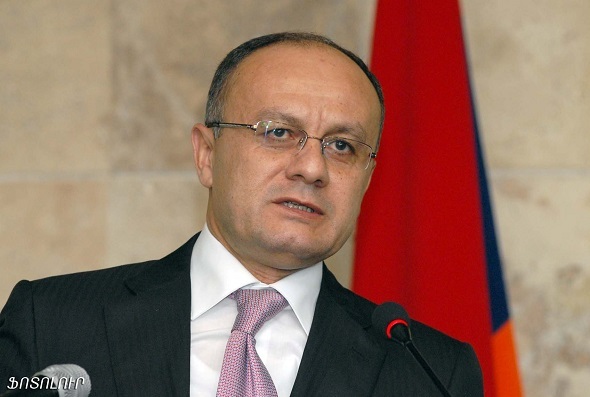 Sahakian then flew to Los Angeles where he met with Armenia’s Diaspora Minister, Hranoush Hakopyan. The two will participate in this year’s Armenia Fund Telethon scheduled to air on Thanksgiving Day. On Sunday, Sahakian attended the Armenia Fund’s annual Western US Gala, where he delivered remarks. I am very much happy to have an opportunity to welcome once again at this overcrowded hall. This is the best evidence of the fact that Artsakh and Diaspora are united and consolidated, that Artsakh-Armenia-Diaspora trinity has been strengthening and becoming more practical day by day. First of all I congratulate you as citizens of the United States of America on electing new president. Indeed, the victory of Barack Obama is an important event in the history of America and world democracy. I hope that his readiness to address issues the Armenian people face will contribute to further strengthening and diversifying relations between our countries. I would like also to thank all of you that even today when the USA faces financial crisis you are ready to contribution to the development and prosperity of your Motherland. At the bottom of our hearts we are grateful to you for such a great devotion and kind-heartedness. Friends, a full year has passed since our previous meeting. I would like to introduce you changes, which also owning to you have taken place in Artsakh within this time period. In virtue of your immediate assistance in different settlemen’s of the republic new schools, kindergartens, medical institutions and water pipes have been built and rebuilt; a number of programs are in progress. Practical and realistic programs have been carried out to solve social problems, to increase living conditions of people and improve demographical situation, a strategically important sphere for our state. Recently we solemnly celebrated an unprecedented event ‘s the Grand Karabakh Wedding. As a result nearly 700 new families were formed in Karabakh. This undertaking was carried out under the patronage of our compatriots from Russia and its goal is to stimulate birthrate and having many children in our country. This is very important for the future of our people and republic. In this respect I want to introduce an important figure: the programs being carried out resulted in nearly 3000 marriages registered within the 10 month period of the current year. This is against the background of 750 to 800 marriages, which were registered annually in the last five years. Considerable changes have taken place also in the size and structure of the state budget. The 2008 state budget exceeds that of the previous year more than 1,3 times. The volume of monies allocated to agriculture, forestry and water industry by current year state budget exceeds that of the 2007 more than 3,8 times, in the sphere of social security 1,5 times. In the spheres of education and science the difference is 27%, in capital investmen’s it is 22%, and in the sphere of culture it is around 29 percent. Reforms have been implemented in the spheres related to investmen’s and entrepreneurship too. As a result of these reforms the country’s economy has received more than 10 million dollar foreign investmen’s in the current year. In spite of positive changes it must be noted that the current year is a quite difficult one for our republic. Almost all settlemen’s of the republic have suffered from unprecedented frost and strong winds. It caused several million dollar damage to our economy. However, the people of Artsakh were able to cope with those difficulties also and came off with flying colors. It became possible by dint of exerting every effort, systemized and consolidated work of population, personnel of the armed forces and authorities of the republic. Artsakh people are well aware that only through laborious work they can build and enrich their country, make the land of their ancestors flourishing and prospering, leave free and independent, strong and invincible Motherland to the generations to come. You, our world-spread compatriots, our sisters and brothers who are always ready to be useful to their Motherland and nation on the other side of the ocean, have important role to play too. The best proof of this can be considered the annual telethons organized by “Hayastan” All-Armenian fund. The entire Armenian people have been united around this idea. I want to assure you that every cent you contribute to the Motherland will give its worthy result, will be multiplied and serve its very purpose. Your kind deeds will be memorized and passed from generation to generation. Compatriots, the “Telethon-2008” is again devoted to the development of Armenian and Artsakh economy especially to revival of the countryside, securing development of villages and rural settlemen’s and improving living standards of the population. The sums collected during the already traditional telethons will be spent on building and reviving state infrastructures, as well as on securing normal living conditions for people. The top priorities of our economic development are the spheres of education, science, culture, health protection, capital construction. The solution of problems related to the security of our republic is of great importance too. Strong and efficient army is the most important guarantee of security of our people. The authorities of the state are have been doing everything possible to keep the army always ready to fulfill the tasks put before it. Friends, I am very much confident that we will continue to build our country together, do our best so secure quiet, peaceful and worthy life for the people of Artsakh on the land of their ancestors land and make their homes and the Motherland prosper. This year we have celebrated the 20th anniversary of Artsakh Heroic Movement with in a great way and reiterated publicly that we are resolute in our choice. The land of Artsakh has been and will always be an Armenian. We have paid too high price to live a free, independent and secure life in our own land and not even for a moment we have right to forget about blood that has been shed by the best sons of the Armenian people. The best perpetuation of the memory of our martyrs will be the strong and prosperous Nagorno Karabakh Republic. We said many times before and will always say that the independence and security of Artsakh are of exclusive values cannot be subject to any speculation. Compatriots, the future of Artsakh is a task for the entire Armenian people and only being united and consolidated we can realize our national goals, only together we can secure bright and radiant future for dear to all of us Artsakh and the worldwide Armenia’s.